New Jersey Chimney, Fireplace & Dryer Vent Cleaning, Service & Repair. Chimney Sweep & Mason Serving NJ since 1989. There have been many "scam" chimney contractors being reported to our company by customers. The latest scam was reported to us on Friday 2-11-2011. Some of the common recent scams are listed below along with identifying poor quality workmanship and some of the methods used by various companies operating in NJ currently. You may view this link http://www.scambusters.org/chimneyrepair.html which gives some insight as to how some of these companies may operate. Common practices include the "free inspections", "low price" sweep" , "bogus or incorrect hazardous repairs", and "out of state contractors." Save yourself time and money by being skeptical of chimney contractors advertising so called "Free Inspections" or " Low priced gimmick chimney sweeps"
"Free inspections"- A legitimate chimney contractor has to pay for workmen's compensation insurance, liability insurance, CSIA (www.CSIA.org ) training and testing (or similar updated industry code training) every three years, work vehicle maintenance, certified technician wages, advertising, industry association dues, etc.. etc..... Some companies currently using coupon mailers with "800" numbers are advertising "free inspections" and are operating out of NY. Many of these companies do not even have the minimum NJ contractors license never mind being CSIA certified. Paying for all these necessary business expenses and running around providing free inspections and accurate reports just does not happen. Folks, this is a scam to get to your home and and charge you for something. Most of the time the scam contractor will want to charge for inferior unnecessary work. Please do not be gullible and fall prey to this type of contractor. If something seems to be good to be true, it is to good to be true. See samples of our company rectifying these hazardous botched repairs- See our samples below. Before allowing any chimney contractor on your property to begin work we recommend that you protect yourself from lawsuits by asking to see a copy of their workmen's compensation and liability insurance (remember if they do not carry workmen's compensation and they fall on your property, both you and your homeowner's insurance can be held liable)...... Always ask for legitimate references that you can actually contact. Try to get references from your area. What you should expect from a certified sweep. "Bogus or incorrect hazardous repairs"
This is probably the most common bad business practice we see. We have been called to many, many customer's homes because of these types of repairs. Unnecessary or poorly installed lining systems can cause significant hazards. a. We do not recommend aluminum lining systems. They are only approved for gas and oxidize or "rot out very quickly"
Bradley Beach, NJ - This liner was installed and rotted out within 3 years. It was clogged and spilling carbon monoxide into the home. b. Installation of undersized or damaged lining systems. We see this quite regularly and this type of installation will cause smoke and carbon monoxide to back up into your home. Sample: See a sample below from a house in Manasquan,NJ where a pregnant woman was living. 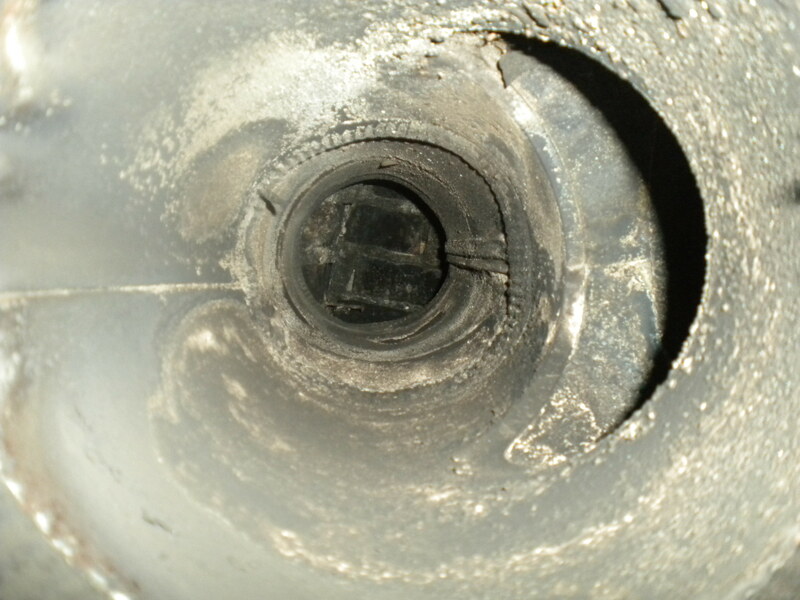 A poorly installed lining system caused carbon monoxide to enter the home and condensation to surface on the exterior of the chimney in the attic. W Belmar NJ Contractor badly repaired the upper end of this chimney and actually left the bricks that had fallen in plugging the chimney. This, of course allowed the hot water heating system to spill Carbon Monoxide in the home. Manasquan NJ- The person living in this house was pregnant at the time and noticed a strange odor and condensation in the attic around the chimney after having a chimney lining installed for the heating system. After an inspection we discovered carbon monoxide backing up into the residence because the lining was completely crushed within the chimney and was not venting. We removed the incomplete damaged aluminum lining and installed a correct stainless steel lining system. The sad part is the contractor left the lining like that aware that he was placing the residents life and that of the unborn baby at risk. c. Repair of structurally unsound leaking crown with crown seal. Many chimney companies will use crown seal (a heavy bodied elastomer) over a badly deteriorated crown which is not the intended use of the product and that is why it will lead to failure in a short period of time. If the crown is badly deteriorated it needs a proper rebuilt or concrete crown. An intact crown with surface cracks can be resurfaced with crown seal. Middletown and Sea Girt NJ- After these customer's tried unsuccessfully on multiple occasions to have roofers and chimney contractors fix their leaking issues they called Certified Craftsmen. We tuckpointed, correctly rebuilt their crown- wash, repaired their flashing and replaced the caps on the right chimney pictured). This solved their leaking issues after their many years of trying. d. Chase covers- We have actually seen galvanized rusting steel chase covers resurfaced with crown seal. Most crown seal products have a water base formulation and are definitely not intended for this use as they have zero rust preventative properties, In fact they can actually increase oxidation by holding moisture under the surface of the product. If a chase cover is badly rotted, replace it with stainless steel. Do not waste your money on this type of bogus sealing repair. 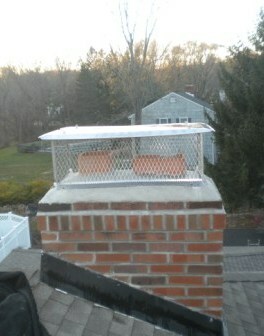 Forked River, NJ- chimney chase cover replacement. 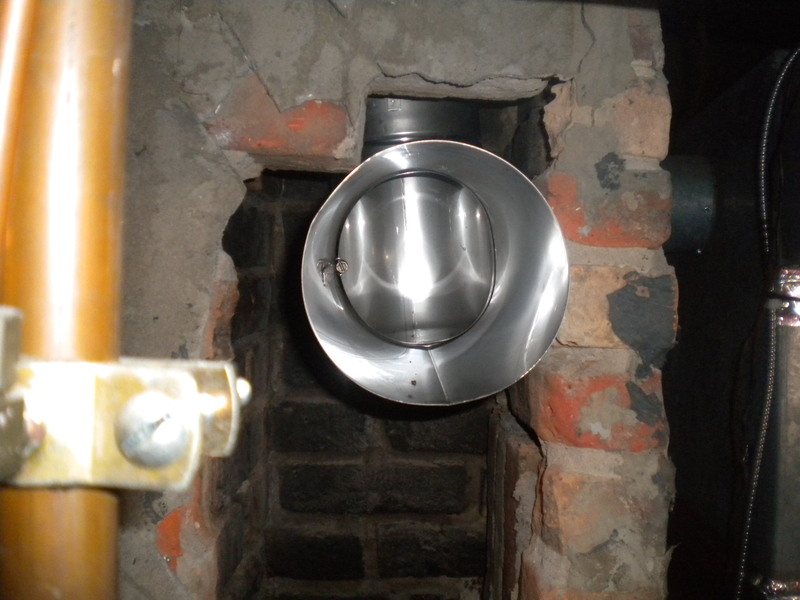 This chimney chase cover was repaired with crown seal as seen on lower left picture. This did not stop the rust or the leaking and required total replacement of the chase. Once again a customer wasted their money paying for a bad repair. 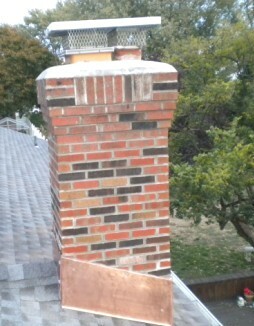 Damaged chimney in Toms River,NJ- This chimney had silicone applied by several contractors prior to Certified Correctly rebuilding the upper end. The first repairs by various contractors proved to be a waste of time and money. This was a chimney contractors attempt to repair deteriorated mortar joints with silicone. He charged the customer for this less than adequate job. We later came in and did a grind and tuckpoint repair. f. Leaking or bad flashing- We have come across jobs where we are literally the 5th contractor called in to fix a leak only to find that all of the other previous contractors attempted to seal the leak with one product or another when the flashing system needed replacement. 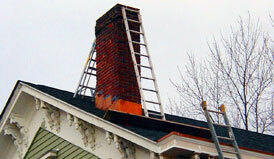 If the flashing or chimney is leaking have a thorough inspection and determine if the flashing needs replacement. Flashing sealing is for the most part is an interim measure not a permanent solution. g. Out of state contractors- Some out of state contractors are certified and registered with State of NJ to conduct business here in NJ. Some contractors are not registered with the state of NJ and operate as a scam. They will generally target an area through telemarketing or coupon mailers. They will come in for a "low price sweep" or "free inspection" and apply high pressure sales tactics. Two customers out of Toms River NJ told us that they were told they needed lining systems and repairs and if they did not have the work completed right then and there, the chimney company was going to have the gas turned off to their home. Don't fall prey to these tactics. Call a CSIA certified sweep or a company with legitimate references to properly inspect your chimney and venting system annually.